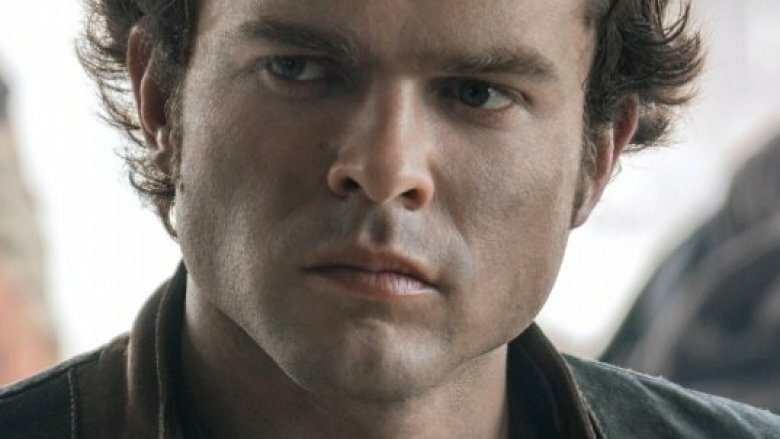 If Thor: Ragnarok can capitalize on a popular meme, why can't Solo: A Star Wars Story? Over the weekend, a Reddit user by the name of SushiShishkebab crafted a brilliant idea: remixing the standard crawl almost all Star Wars films utilize and proposing something pretty hilarious for Solo: A Star Wars Story. Piecing together footage from Star Wars: The Force Awakens and the title card from Solo, the fan crafted a new opening and posted it to the /StarWars subreddit, where it quickly soared to the front page of the entire site. The video opens on Kylo Ren/Ben Solo (Adam Driver) slicing his red lightsaber through Han Solo's (Harrison Ford) stomach, undoubtedly the biggest what-the-heck-just-happened moment from The Force Awakens (and perhaps from the entire franchise in its recent years). Just as the troubled father-son pair lock eyes, with the camera zooming in on Han's anguished face, everything stops short and we hear a record scratch. "Yep, that's me!" an offscreen voice (as Han) states. "You're probably wondering how I ended up in this situation." We then hear the iconic initial opening bars of The Who's "Baba O'Riley" play as golden typography floats together to display the film's title. Essentially, the whole thing is a take on the "record scratch, freeze frame" meme that pokes fun at the movie cliché in which the central protagonist is introduced to the audience by the screech of a record stopping followed by a frozen frame of footage, which is then accompanied with voiceover narration of how the character found themselves in the mess they're currently stuck in. Taika Waititi's Thor: Ragnarok riffed on this same joke in its first teaser trailer, which featured Chris Hemsworth's God of Thunder wrapped up in chains, stating, "I know what you're thinking: how did this happen?" While it's almost a guarantee that Solo will be shown sans-crawl, since the first Star Wars series standalone, Rogue One, didn't have one, this fan video is still a whole lot of fun. Directed by Ron Howard, Solo: A Star Wars Story stars Alden Ehrenreich as Han Solo, Woody Harrelson as Tobias Beckett, Emilia Clarke as Qi'ra, Donald Glover as Lando Calrissian, Thandie Newton as Val, Phoebe Waller-Bridge as L3-37, Joonas Suotamo as Chewbacca, Paul Bettany as Dryden Vos, and Harley Durst as Moloch.